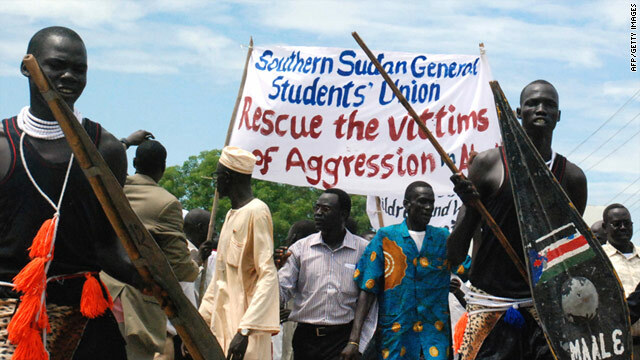 Sudanese protesters in the southern capital Juba demonstrate against the northern military occupation of the Abyei region in May. Washington (CNN) -- President Barack Obama applauded Wednesday efforts to quell violence in Sudan that has erupted ahead of independence for the south and has forced tens of thousands of people from their homes. The Sudanese government and the Sudan People's Liberation Movement (SPLM) signed an agreement Monday that allows U.N. peacekeepers in the disputed region of Abyei. The two sides agreed in principle on the need for a third party to monitor the ill-defined border between north and south before the scheduled July 9 independence for the south. "I commend the parties for taking this step forward toward peace, and I urge them now to build on that progress and agree to an immediate cease-fire in Southern Kordofan," said a statement from the White House Press. Ethiopia will deploy a brigade of 3,200 troops to Abyei after both north and south withdraw their forces from the region, said Dina Mufti, the Ethiopian Foreign Ministry spokesman. I commend the parties for taking this step forward toward peace, and I urge them now to build on that progress and agree to an immediate cease-fire in Southern Kordofan. --White House Press Secretary Jay Carney. Fighting has also erupted in the oil-rich border state of Southern Kordofan and Obama expressed alarm at the "disturbing reports of attacks based on ethnicity." "The United States condemns all acts of violence, in particular the Sudanese Armed Forces aerial bombardment of civilians and harassment and intimidation of U.N. peacekeepers," Obama said. "With a cease-fire in Southern Kordofan, alongside the agreement to deploy peacekeepers to Abyei, we can get the peace process back on track," he said. "But without these actions, the roadmap for better relations with the Government of Sudan cannot be carried forward, which will only deepen Sudan's isolation in the international community." The people from the Nuba Mountains in Southern Kordofan are northerners but they aligned with the south's rebel movement during Sudan's decades-long civil war. They are viewed as a threat by Khartoum because Southern Kordofan will remain part of the north after independence. "The treatment of civilians in South Kordofan, including the reported human rights abuses and targeting of people along ethnic lines, is reprehensible," said Valerie Amos, the United Nations under-secretary general for Humanitarian Affairs and Emergency Relief Coordinator. Between Abyei and Southern Kordofan, the United Nations estimated that about 160,000 people have been displaced from their homes. Southern Sudan voted for independence in a January referendum that was largely peaceful. But with its separation pending, tensions have heightened to civil war days and there has been little cause for celebration for the birth of a new nation. The U.S. State Department issued a warning Wednesday, urging U.S. citizens to avoid travel to the border areas -- including Abyei and Southern Kordofan -- as well as the Darfur region of Sudan.